It began inauspiciously but developed into a nearly perfect Sydney Spring Sunday. Rain was falling at the appointed hour of departure but in the nature of plans made for Sunday morning by the time we rolled away on our bicycles it was more like midday. By then the sun was shining. Its heat had a summer bite but in the shade it was still jumper-cool. When Mitch, Mac and I arrived at St Leonards Park we found Erin threatening to mobilise her Twitterverse behind an #OccupyBarbeque movement. A gaggle of parents and costumed toddlers had commandeered the only public barbecue in the park, and quite possibly the only one in North Sydney. They had arrived first, so fair enough, first dibs; but while their sausages cooked on one plate the other was serving as a marshalling area for their food. Despite our inquiries and hungry stares they refused to share. It seemed, frankly, downright un-Australian. The tide turned when Mitch asked the bloke at the North Sydney Bowls Club if they had a barbecue we could use. In short order, we all had drinks in hand, the bacon, corn fritters and potatoes were grilling and Mac had set us up with four sets of bowls. Hunger sated and joined by Jim and Evelyn we set to roll a few ends on a green with as impressive a setting as any in town. The Opera House, Bridge, all of the CBD and Eastern Suburbs floated just beyond the edge of the ground. Best bowling green view in the world? Mitch explains the game to Mac. Erin sends one down the rink. Beer, bowls and spring sunshine. We made it to the cricket at North Sydney Oval, the original goal of the day, with a couple of hours of play left. The Victorian Bushrangers had amassed 317 runs on seven wickets and the NSW Blues were doing the job of chasing that down. A couple of wickets fell and several booming sixes cleared the fence – one left the ground entirely. The Blues had the Vics in their sights and ultimately finished them with 49 balls to spare. Smith was 185 not out from 123 balls – a record for a NSW batsman in the One Day series. Rolling down Miller Street toward North Sydney station it seemed too lovely a late afternoon, by now six-ish, to just get on the train there. 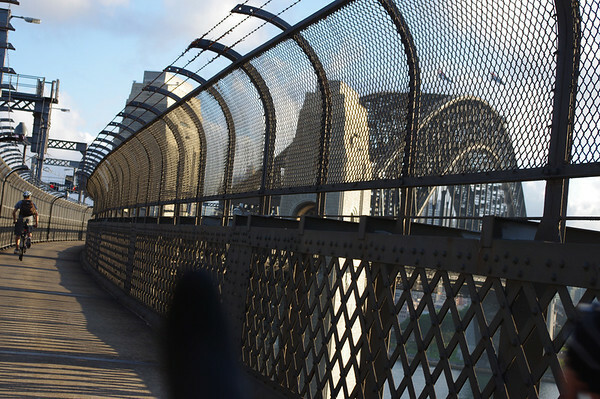 Mac had yet to ride over Sydney Harbour Bridge so that settled it. The sun, still bright and warm on the western horizon, bathed the bridge in a warm golden light. The yachts that peppered the harbour earlier had long headed home; the only boat I saw was a ferry chugging from Balmain to Lavender Bay. Pedalling the approach to the Sydney Harbour Bridge. To round the near-perfect day off with a near-perfect ending we introduced Mac to the Hero of Waterloo for a Guinness and to listen to the first few tunes of the Sunday evening band.